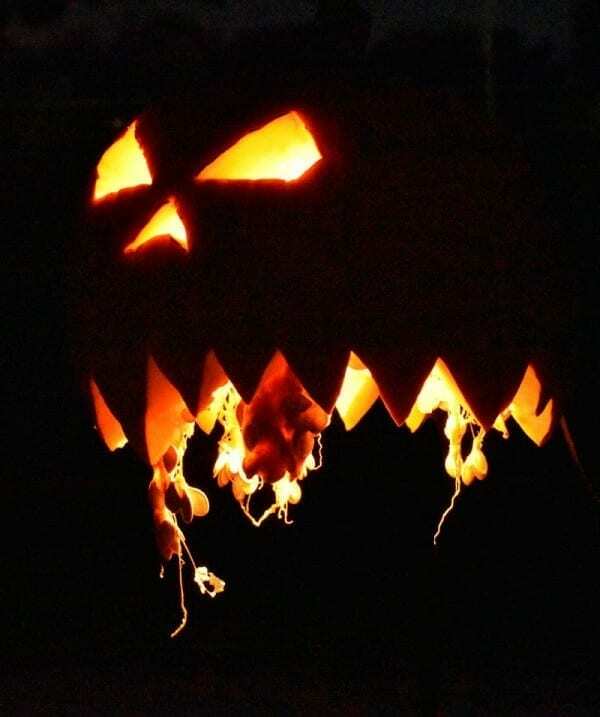 These creepy-looking disemboweled Jack-O-Lanterns are just the coolest when it comes to pumpkin carving! 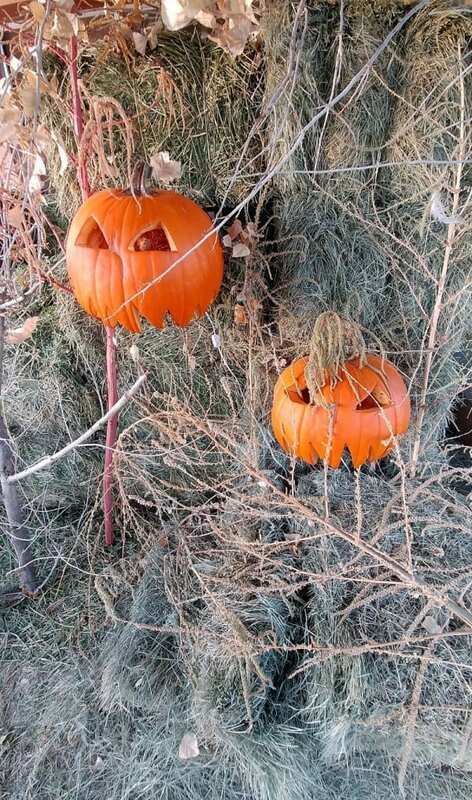 With their stringy, gross-looking guts dangling out the bottom, they’re definitely a step up from the days when I was a kid and would carve out the traditional happy Jack-O-Lantern face in my pumpkins!. 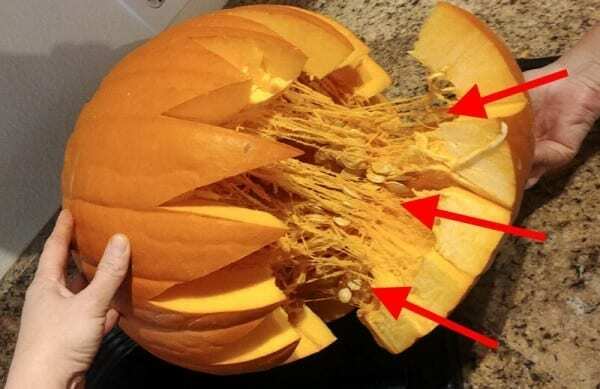 The best part about these wicked-looking Jack-O-Lanterns is that you don’t have to clean out the insides, which makes them even faster to carve! Draw your eyes (and nose) and cut them out. I don’t completely clean all of the guts out of the eyes and nose, I leave some so it looks creepier. 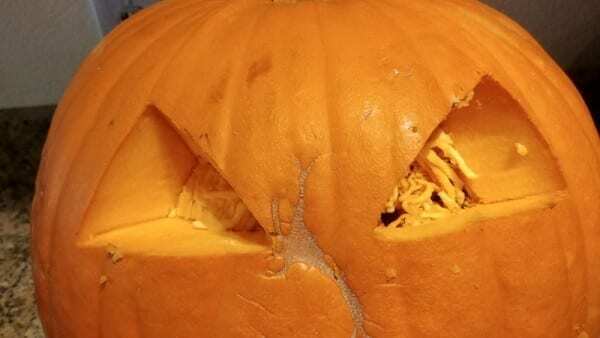 Now draw and cut a jagged bottom, making sure to jig-jag all the way around the bottom until it separates from the top of the pumpkin. 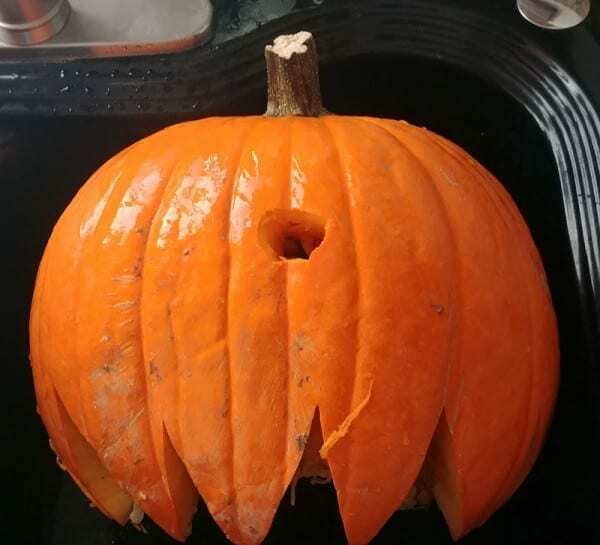 Start to pull the pumpkin apart. 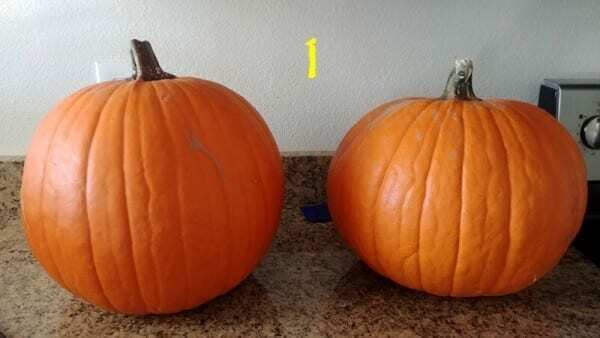 (After I took these pics I later learned that as you pull it apart, you can gently take some scissors and clip all the strings from the bottom part of the pumpkin. This will help to avoid them breaking at a shorter length. 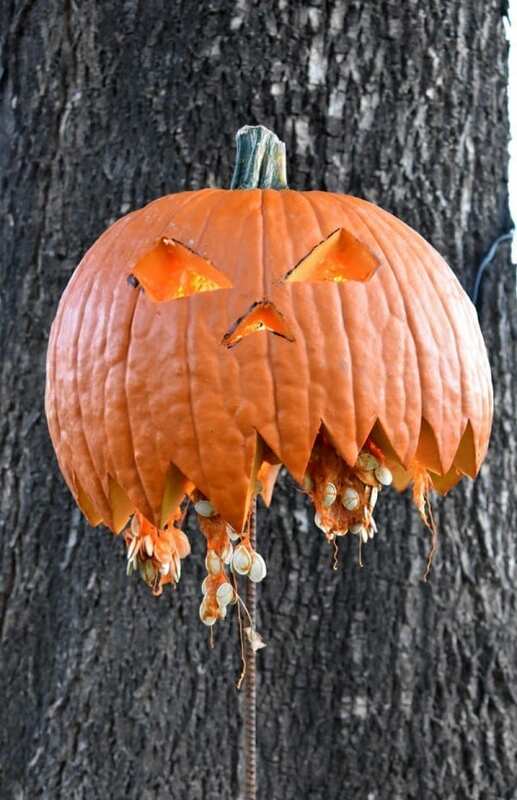 You want the strings long and danging as this is what hangs out the bottom and makes these pumpkins look so creepy! 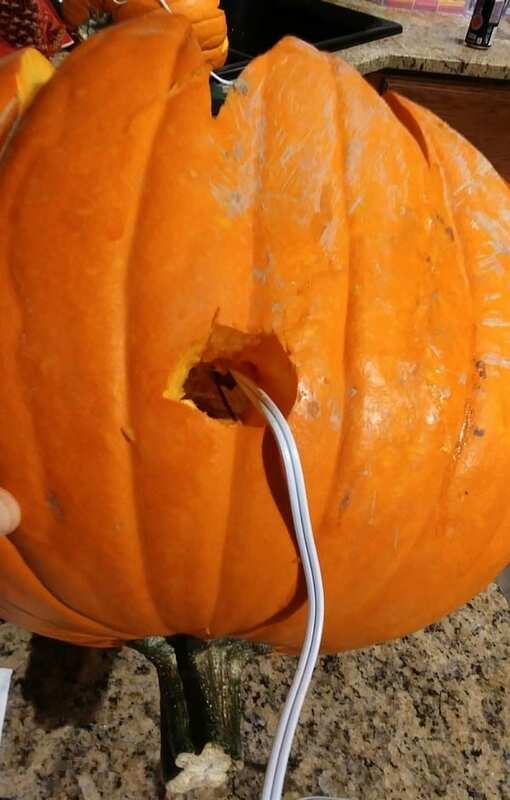 You’ll also be stringing the light cord through the hole as well, with the bulb hanging just inside the pumpkin. 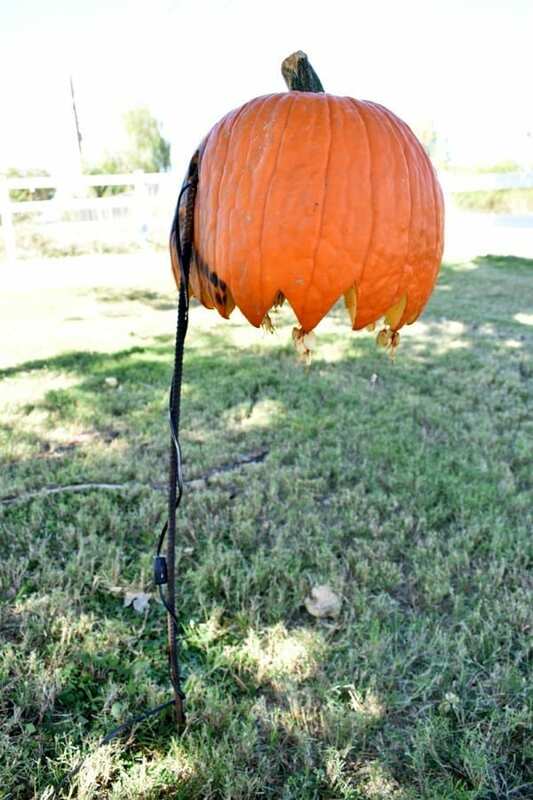 The first way I hung mine was in a hay pile. For the hay pile I simply stuck my pipe straight into the hay, leaving about about 1 or 1 1/2ft sticking out. 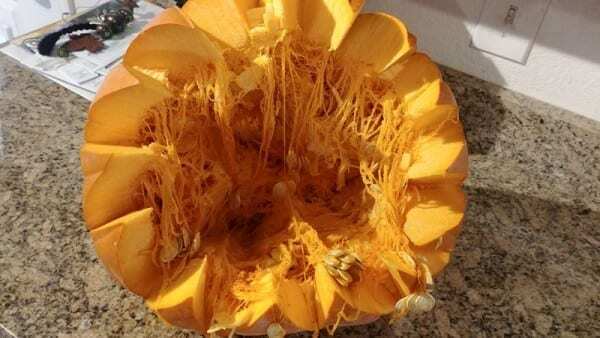 Then I pushed my pumpkin onto the part of the pipe that was sticking out. 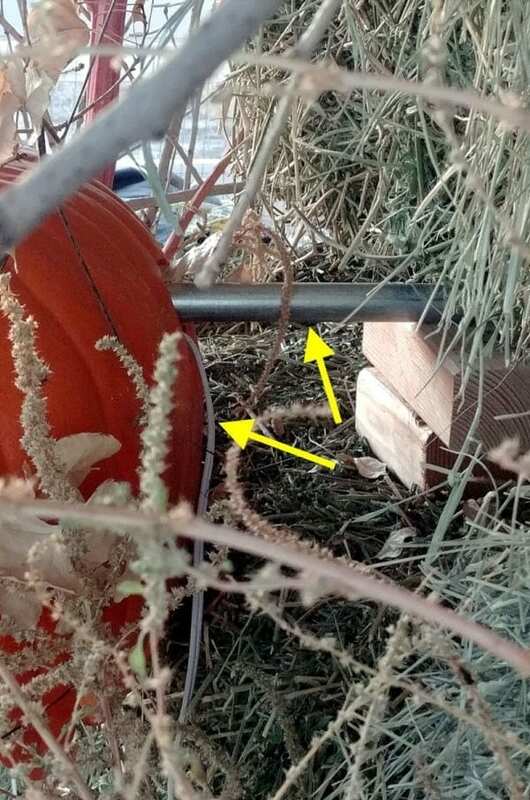 You can see in the pic below, both the light cord and the pipe going into the back hole of the pumpkin. 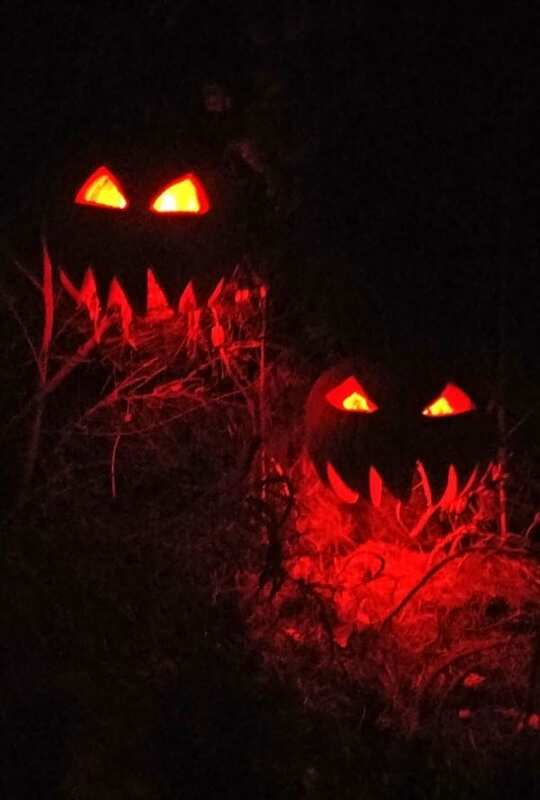 This is what they looked like in my hay pile at night! 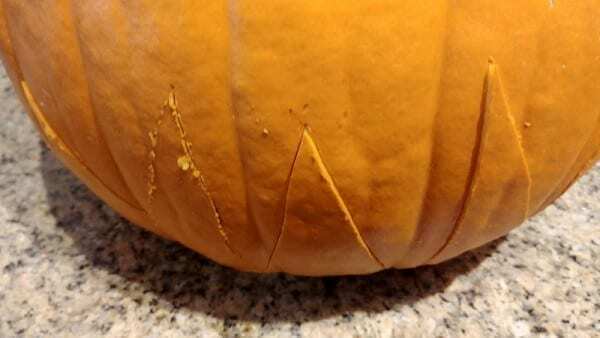 The second way I hung my pumpkin is to use your pipe as a stake by bending it into an upside down ‘L’. 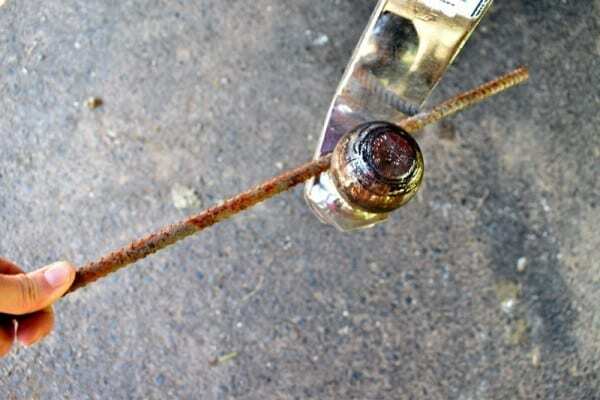 To do this I bent my re-bar around the ball hitch of my truck by using the weight of my body as leverage. 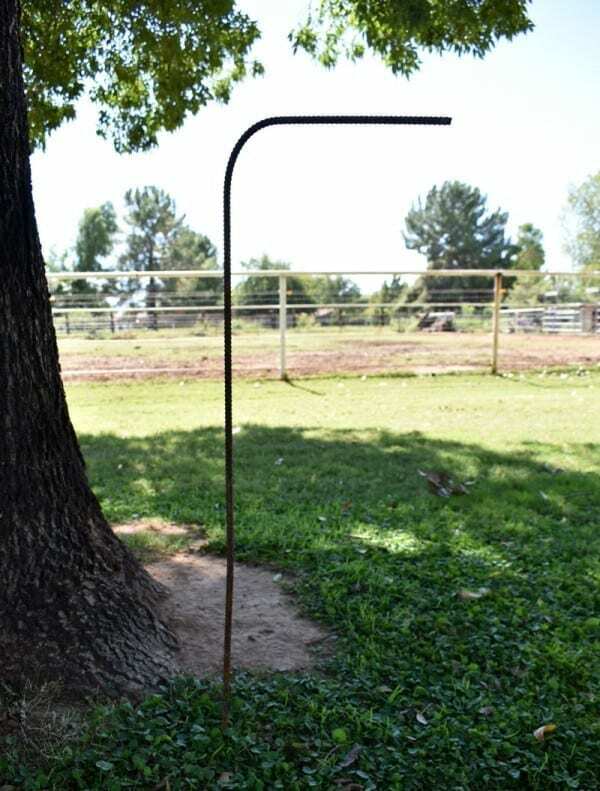 Simply place the re-bar as so and pull to the right with your hands. 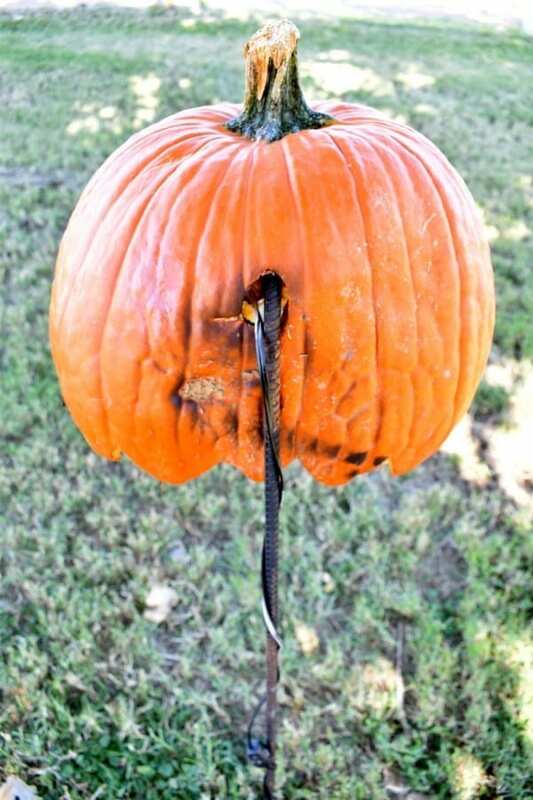 Simply push the pumpkin onto the re-bar through the back hole. 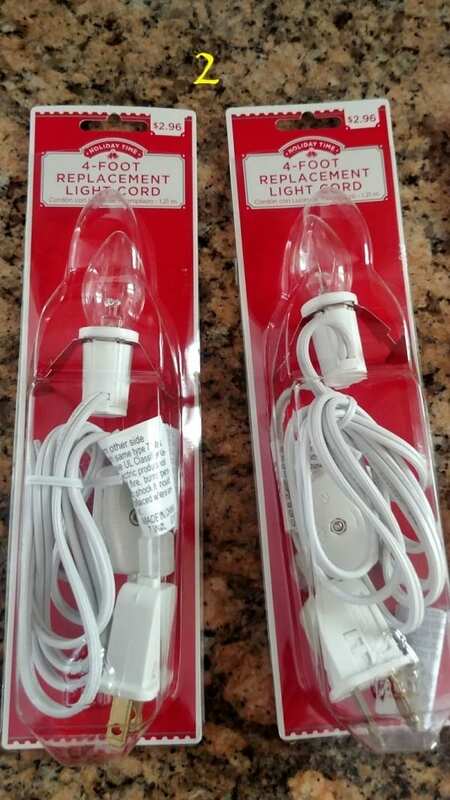 I wrapped the light cord around the re-bar to conceal it. 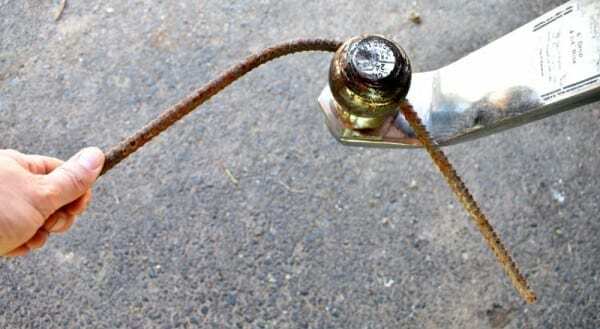 Also, you can spritz the re-bar and cord with some black spray paint to hide it. 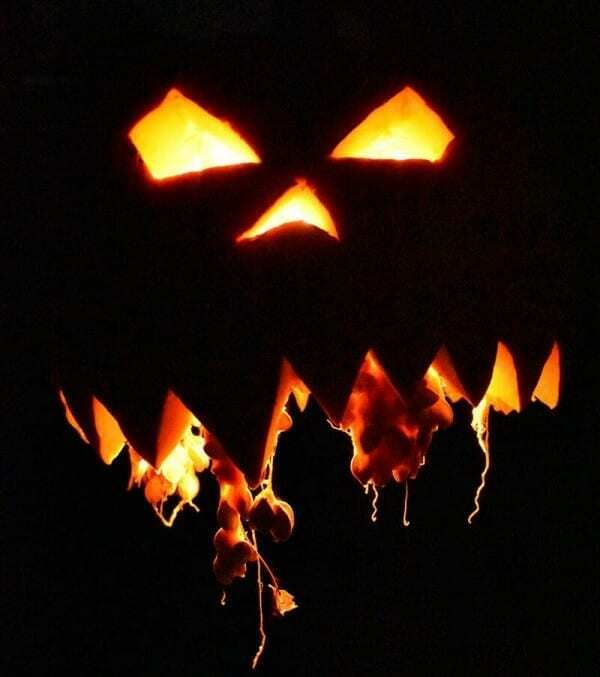 Here he is at night, so creepy!! !